The internal temperature evolution in a snowpack or a thickness of ice (e.g., a slab of sea ice or the interior section of permafrost or a glacier) is governed by conservation of energy. This is described by the first law of thermodynamics, balancing the rate of change of internal energy with the fluxes and sources of energy in the snowpack. Conductive heat transfer is the main process that governs the rate of change of internal energy in the near-surface layer. In addition, shortwave radiation can penetrate to the subsurface, and there are internal sources/sinks of energy associated with latent heat exchange (internal melting and refreezing). There can also be heat advection from percolation of melt or rainwater in the snow and ice. layer dz. For radiation with angle of incidence b measured from the vertical, the path length across this layer is , = dz/cos(b). 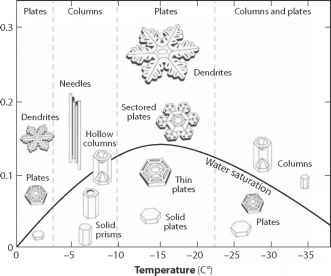 Temperature evolution within the snow or ice can be numerically modeled from (3.5) by dividing the volume into several layers and solving the energy balance in each layer, subject to boundary conditions determined by the surface energy balance, Eq. 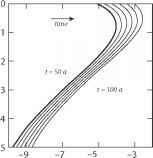 (3.1), and heat flux into the base of the snow or ice volume from the ground, lake, river, or ocean. Such a model can be used to simulate the daily or seasonal temperature wave in snow and ice and to predict the internal temperature evolution. Figure 3.2 illustrates the application of these equations to thermal diffusion in snow and ice. Two simple but important examples are presented: (i) diurnal temperature cycles in a seasonal snowpack (figure 3.2a) and (ii) annual temperature cycles in permafrost (figure 3.2b). The latter example also illustrates the timescale for propagation of century-scale changes in surface temperature into the ground. The diurnal temperature evolution in snow in figure 3.2a is based on an idealized sine wave for the diurnal atmospheric temperature, with a minimum at midnight and maximum at noon. In this example, the mean daily temperature is -8°C, and the daily temperature cycle has an amplitude of 16°C. This atmospheric signal penetrates to a depth of a few decimeters, but it is strongly damped, with a time lag of a few hours. The depth of penetration is sensitive to the thermal conductivity of the snow, which is primarily a function of snow density (chapter 2). Figure 3.2. (a) Modeled penetration of an idealized diurnal temperature cycle in a seasonal snowpack. Temperature is shown for the upper 45 cm of a 1-m snowpack, plotted at 2-hour intervals for a 24-hour period. Black lines indicate a warming from 0200 until 1200 (left to right), and gray lines correspond with a cooling phase from 1400 until 0000 (right to left). 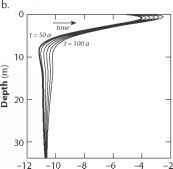 (b) Temperature response to a surface warming in the upper 35 m of a 100-m-deep section of permafrost. This shows the diffusion of a surface temperature warming to depth for a 2°C temperature increase across 50 years. The temperature profile is plotted every 10 years (50, 60 . . . 100 years, from left to right) for the numerical experiment described in the text. The inset provides a closer view of the upper 5 m.
The same physics applies to the permafrost in figure 3.2b, but the temporal and spatial scales of this example are much greater. Figure 3.2b plots the solution of Eq. (3.5) in the upper part of a 100-m-deep section of permafrost. This example includes both "equilibrium" and transient surface temperature boundary conditions to illustrate the diffusion of a surface warming trend in permafrost. The simulation is based on an idealized sinusoidal annual temperature cycle that repeats itself across 1000 years. The deep permafrost equilibrates by the end of the 1000-year "spin-up" simulation. The mean annual surface temperature for this initialization is -11°C, with a geothermal heat flux of 0.05 W m-2 prescribed at the base. At depth, permafrost temperatures reach a steady state after several centuries. The upper 10-15 m of the ground feels the annual temperature cycle, as seen in the initial temperature profile (heavy line labeled t = 50a in figure 3.2b). with depth. Below 35- to 40-m depth, the surface temperature change is not yet detectable. This indicates the timescale of temperature response to climate change in frozen ground, although the detailed response depends on the thermal conductivity, heat capacity, density, and porosity of the soil or rock matrix. Temperature diffusion in pure ice has a similar timescale to that of frozen ground. 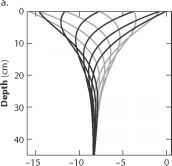 Radiative fluxes at the atmospheric interface are of order hundreds of watts per square meter. The geother-mal heat flux from the ground into the base of a snow-pack or a terrestrial ice body (glaciers, ice sheets, and permafrost) is negligible compared with this, with typical values of 0.04-0.06 W m-2. Although this is a minor component of the overall energy budget, ground heat flux still helps to warm the base of a seasonal snowpack over the course of the winter, particularly in deep snow-packs where basal snow is well insulated from the atmosphere. Similarly, geothermal heat flux provides a steady trickle of heat to the base of terrestrial ice masses that are tens to thousands of meters thick. This ultimately limits the depth of permafrost, and for many of the world's glaciers and ice sheets, this supply of heat drives basal melting at rates of several millimeters per year. The basal boundary is more complex and important for sea ice and where glaciers and ice sheets are in contact with the ocean, as oceanic heat fluxes are commonly several watts per square meter, greatly exceeding geothermal heat. Even in sea ice, however, the primary concern in modeling snow/ice thermal evolution and melt is quantification of energy fluxes at the surface-atmosphere interface. The next section describes these fluxes in greater detail.